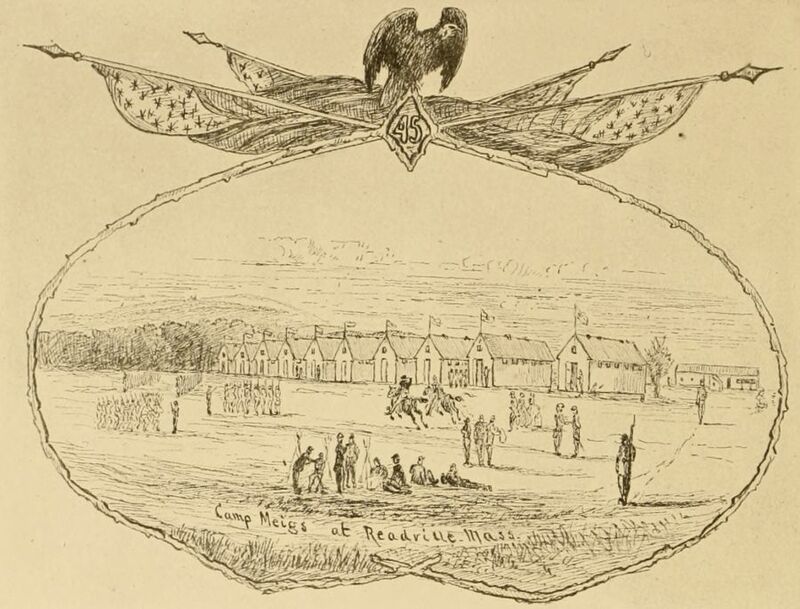 Camp Meigs, from “The Campaign of the Forty-Fifth Regiment,” 1882. A question recently came up on a reenactor Facebook page that I subscribe to regarding the locations of Civil War training camps in Massachusetts. I had done some research on this subject years ago but never completed a full survey as to how many units trained at which camps. More importantly, although I knew roughly where the major camps were located, I had never really tracked down their precise locations. So, the question motivated me to dig into this research once again. Ranking the most active camps was simply a matter of somewhat monotonous tallying. This information came almost entirely from paging through James L. Bowen’s Massachusetts in the War, 1861-1865. Determining the locations of the camps, on the other hand, involved some interesting historical detective work. Some of the sites are marked, and might be well known locally to some, but their locations are hardly well-publicized and in some cases challenging to track down. It was interesting to learn which have been built over and which remain open land, sites worth a visit, where one might be able, with some imagination, to picture the place as it appeared during the war. None of the sites, with the possible exception of Camp Meigs in Readville, have any vestiges remaining of the Civil War era structures. I should mention that my tally focused on the training sites of regiments of infantry, cavalry, and batteries of light artillery. Some units trained at two different camps and so a few units will be listed twice below. I did not include the numerous unattached companies (most of which seem to have been trained at Camp Meigs). I also did not include a tally of where the various regiments were mustered out. Upon returning home, regiments would typically be stationed at one of these camps for a short time as they awaited final pay and official mustering out. This “other side of the coin”–supporting returning regiments–was certainly a major aspect of operations for these camps. But my research, at least for now, does not encompass that aspect. So far, I’ve accounted for about 23 training camps across the Commonwealth. Some sources indicate that the were about 27 or 28, so perhaps I still have a few to track down. The great majority of these camps were temporary in nature, established to train a single regiment. On the map below, I have pinpointed the locations of the ten most active camps, ones that existed for much of the war and those that turned out three or more units. Zoom in to get a better look at each site. I’ll here offer some historical and geographic details on the top five camps, perhaps saving the others for a “part two” entry. Before the war: Straddling the Dedham/Boston line in the neighborhood known as Readville, Camp Meigs was by far the most active training camp in the Commonwealth during the Civil War. The site, known as Sprague’s Plain before the war, had been frequently used as a mustering point for the local militia. In 1861, it was owned by a farmer named Ebenezer Paul who was surprised one morning to find men sitting under one of his elm trees who informed him that the Commonwealth required his land and that he would be compensated fairly for it. Period of activity: The first units to set up on Sprague’s Plain in early July 1861 were the 18th Massachusetts, who called their spot Camp Brigham (after the Commissary General of Massachusetts, Colonel Elijah Brigham) and the 20th Massachusetts, who named their location Camp Massasoit (after the 17th century sachem of the Wampanoag). Some accounts indicate that the sachem’s name was used because the area was believed to have once been a Native camp. After sending four early regiments off, the camps saw little use during the first half of 1862, until the call went out in August for nine-months regiments. At that time, Camps Brigham and Massasoit, adjacent to one another, were combined under one name: Camp Meigs. A significant complex of barracks was built. Also a hospital, stables and many other outbuildings. From that time forward, Camp Meigs was in constant use until the end of the war. Units trained: 28 units (not including unattached companies and battalions). They were the 11th, 18th, 24th, 43rd, 44th, 45th, 47th, 48th, 54th, 55th, 56th, 58th, 59th, 60th and 62nd regiments of infantry, the 1st, 2nd, 4th and 5th regiments of cavalry, the 2nd regiment of heavy artillery, and the 5th, 9th, 11th, 12th, 13th, 14th and 16th batteries of light artillery. No other training camp in Massachusetts came close to this level of activity. The site today: After the war, the portion of Camp Meigs on the Dedham side was purchased in 1869 by the Norfolk Agricultural Association and was used as an agricultural fair ground. This eventually became the Readville Race Track, first for horses, then a popular site for motor car races. Today, the site is heavily developed. The Dedham portion is occupied by a sprawling, run-down commercial complex. The Boston portion is largely covered by a cluster of side streets and small houses. One of these houses, allegedly, was one of the camp buildings (and certainly appears to be). If so, this would make Camp Meigs the only training site (of which I’m aware) that still has an original structure standing. A small park of nearly three acres (featuring a playground, tennis courts and baseball field), named Camp Meigs Park, sits in the middle of this neighborhood at Hyde Park Avenue and Stanbro Street on a piece of ground where a portion of the barracks once stood. A marker was recently placed in the park dedicated to the three black regiments that were trained there–the 54th and 55th Massachusetts Infantry regiments and the 5th Massachusetts Cavalry. Before the war: The village of South Lynnfield was a quiet locale before the war, situated on the crossroads of the Newburyport Turnpike (now much enlarged and known as Route 1) and the Salem Road (now Route 129). The most notable landmark near the tiny village was the Lynnfield Hotel, built for travelers along the Turnpike. The South Reading Railroad also passed by this crossroads, providing convenient transportation for the camp. Period of activity: Initially named for Massachusetts Adjutant-General William Schouler, the camp was designated early in the war as the Commonwealth’s primary training ground for new, three-year regiments from eastern Massachusetts. Elements of the 17th Massachusetts were the first to go into camp there. Activity was steady through the second half of 1861. Like Camp Meigs, the camp went all but dormant in the first part of 1862 due to the pause in federal calls for troops. After Lincoln issued the call on July 2, 1862 for 300,000 volunteers for a three-year term of service, the camp was revived and renamed Camp Stanton (after the U.S. Secretary of War). It remained busy through the fall of 1862 until the last of the regular three-year regiments, the 41st Massachusetts, was sent off on November 5, 1862. Units trained: A total of 14 units. They were the 17th, 19th, 22nd, 23rd, 33rd, 35th, 38th, 39th, 40th, and 41st regiments of infantry and the 3rd, 5th, 9th, and 10th batteries of light artillery. The site today: The quiet village that once was South Lynnfield is now bisected by Interstate 95. The site of Camp Schouler/Stanton is largely covered by a cloverleaf connecting the interstate with Route 1. Green Street, off of Route 1, also runs through a portion of the former camp. I am not aware of any marker on the site. The second most active training camp in the Massachusetts seems to be all but forgotten. Before the war: In 1860, just months before the war, the Middlesex North Agricultural Society purchased land about a mile south of the center of Lowell from the Boston & Lowell Railroad Company for a fairground. Before the war began, it was used by the Massachusetts Militia for musters and drills under the command of militia General Benjamin F. Butler, a prominent resident of Lowell. When the war began, Butler played a large role in creating a more permanent camp on this location. Period of activity: The primary period of activity at Camp Chase (named after U.S. Secretary of the Treasury Salmon P. Chase) was from September 1861 to February 1862. It was occupied again in the fall of 1862, during which time it seems the camp was temporarily referred to as Camp Henry Wilson (U.S. Senator from Massachusetts and briefly the colonel of the 22nd Massachusetts Infantry). It was occupied again in the early months of 1863. After that time, the camp was no longer used as a training ground. Units trained: A total of 8 units. They were the 26th, 30th, and 31st regiments of infantry, the 3rd regiment of cavalry (companies to supplement those already in the field), and the 4th, 6th, 7th and 15th batteries of light artillery. The site today: After the war, the site went back to use as an agricultural fair ground with a racing track. The fair ground ceased operation in 1906. The property was eventually turned over to the City of Lowell and is now occupied by the Benjamin F. Butler Middle School and Shaughnessy Elementary School at 1140 and 1158 Gorham Street. I am not aware of any marker on the site commemorating Camp Chase. Before the war: A fairly common pattern for Massachusetts Civil War training camps–Camp Wool was organized on the site of an agricultural fairgrounds. The Worcester Agricultural Society’s busy fairground was located in the West End of Worcester, bounded by Highland Street on the north, Sever Street on the east, Cedar Street on the south and Russell Street (then known as Agricultural Street) on the west. Period of activity: Initially the camp was known as Camp Lincoln (in honor of Levi Lincoln, former Massachusetts Governor and prominent Worcester citizen). The first regiment to occupy the site was the 21st Massachusetts in July of 1861. It was soon followed by the 25th Massachusetts. After these regiments departed in August and October respectively, the camp was not used until the July 1862 call for additional three-year regiments. Renamed Camp Wool (for General John Wool, the oldest general in the Regular Army and one of the most respected), the site was designated as the rendezvous for three-year regiments from western Massachusetts. Four regiments trained here during the summer and fall of 1862. The camp remained quiet during 1863. A final regiment, the 57th Massachusetts, trained here in the spring of 1864. Units trained: A total of 7 units. They were the 21st, 25th, 34th, 36th, 49th, 51st, and 57th regiments of infantry. The site today: The site of the Worcester Agricultural Fairgrounds and Camp Wool is a dense neighborhood today. Part of the area is occupied by Becker College, established in 1887. A plaque commemorating Camp Wool was placed in adjacent Elm Park along Russell Street in 2008. As Elm Park sat (and still sits) just across Russell Street from the site of the Agricultural Fairgrounds, it seems a sensible place to locate the plaque where people will stop and read it. Though I wonder if it generates some confusion and assumptions that Elm Park was actually the site of the camp. Before the war: Camp Cameron is perhaps one of the better known Civil War training camps in Massachusetts thanks to the efforts of the Cambridge Historical Commission, the Cambridge Public Library and other organizations. It occupied an area in North Cambridge and Somerville known then as Clarendon Hill. Roughly, the site is bounded on the west by Massachusetts Avenue, on the north by today’s Clarendon Avenue, on the east by Broadway and on the south by today’s Shea Street. At the time the area was quite rural and of the above only Massachusetts Avenue and Broadway existed as country roads. The Commonwealth initially attempted to establish a camp at nearby Fresh Pond but the area was found to be to damp and unhealthy. Clarendon Hill was leased by the Commonwealth from several landowners and construction began on what would be a sprawling complex of barracks and other structures. Period of activity: The 1st Massachusetts occupied the camp on June 13,1861 while it was still being built. It was soon followed by the 11th Massachusetts. Camp Cameron (named after U.S. Secretary of War in 1861 Simon Cameron) was an early war camp, eventually superseded by those above, particularly Camps Meigs and Stanton. However, from June 1861 to January 1862 the site was quite busy. It would also see use in May, June and August of 1862. Units trained: At least 8 units trained here. They were the 1st, 11th, 16th, 26th, 28th, and 38th regiments of infantry, and the 1st and 8th batteries of light artillery. The site today: Beginning as early as the 1870s, the site of Camp Cameron began to be developed as a residential neighborhood. It is now thoroughly built over. The importance of these camps of instruction can not be overstated. Without rigorous instruction, a unit was doomed to suffer dreadful casualties in their first engagement. Sadly, this did indeed happen with some Massachusetts units that were rushed too quickly to the front (the 35th Massachusetts at Antietam comes to mind). The administration of the camps was a tremendous undertaking on the part of the Commonwealth and an aspect of the war’s history that deserves better attention. This entry was posted on Wednesday, May 20th, 2015 at 7:40 pm	and tagged with American Civil War, Camp Cameron, Camp Chase, Camp Meigs, Camp Schouler, Camp Wool and posted in American Civil War. You can follow any responses to this entry through the RSS 2.0 feed. As luck would have it, I can help a little bit with some of this myself, having looked into some of the ones local to me. * Camp Reed was “on Gunn’s Lot near Wilbraham Road.” This camp was on the site of the modern-day Mass Mutual facility, between Wilbraham Road and State Street, to the east of Benton. I understand there is a plaque commemorating its Civil War history on the campus, but not being an employee, I have no access to the thing. The 27th Massachusetts trained there. McLain (et al) also cite a Camp Banks “…located along Boston Road in Springfield.” I’m not clear on where this one actually was beyond that– and I think they may be conflating that with Camp Reed. I’d need to dig deeper to be sure. Brilliant! Thank you. I thought you might be able to shed some light on Springfield sites. I was trying to pin down Camp Reed but could not. I, too, suspect that Camp Banks was the same site, but that is anything but certain at this point. Camp Andrew was located at the site of Brook Farm in the West Roxbury district of Boston. The 2nd Mass. Vol. Inf. trained there. Brook Farm/Camp Andrews is located about 680 Baker Street, Boston. From time to time I noticed that other regiments had been organized there but I do not recall exactly which ones. I’ve visited the site of Camp Andrew a number of times. A good place for a stroll. And Brook Farm is, of course, a fascinating subject. The camp site is nicely preserved and marked by a boulder while the Brook Farm site is sadly overgrown. I have not come across Brightwood at all. Will have to look into that one. I could be dead wrong, but I would bet a plug nickel that Brightwood refers to the Hampden/Pynchon Park site along Avocado Street. The Brightwood neighborhood of Springfield is directly across Route 20 from the park(s). This segues nicely with your (Patrick’s) comment below about it being a mustering area, given that both locations (Brightwood and the parks) are a very short march to the Springfield train station. Although the buildings have changed since 1861-5, the location has been constant. There was also a Camp Adams in Medford on land formerly owned by John Q. Adams on the Mystic River. The present Mystic River Reservation may be on or very close to this site. It is described as being “on the main road from Boston to Medford” (probably the present Route 28) and on the Mystic River where the water is noticeably brackish. Had not heard of Camp Adams in Medford. Thanks. There was a Camp Adams in Quincy, a temporary camp where a battery trained. I think that camps like Brightwood in Springfield and Adams in Medford might have been staging areas where formations that had already been mustered in and equipped were sent to await transportation after they had been accepted into federal service. Camp Kilmer in New Jersey had a similar function in WWII. I look forward to Part Two, since I’m sorry not to see West Roxbury’s Camp Andrew in your top five. Camp Andrew was located on Brook Farm, the site of the 1840’s communal experiment by Transcendentalists/Socialists. The ubiquitous 2d Massachusetts Infantry Regiment trained there starting in May, 1861, and a lieutenant in that regiment’s Company F was the then inexpeienced Robert Gould Shaw. The 2d Massachusetts was, like the 20th Massachusetts, a “Harvard Regiment.” And the men of the 2d Massachusetts comprised a very interesting melting pot, with Irish Catholic immigrants fighting alongside Catholic-hating Brahmins. Yes, I believe there will be a Part Two. There were so many sites that I couldn’t include in one entry. Camp Andrew was not heavily used (really just the 2nd Mass) but that certainly was an important regiment and the site, unlike so many, is a rare example of a well preserved space that one can visit today. Definitely worthy of attention. Well i just wanted to thank you for your thorough research,especially on Camp Wool.,(Lincoln). I too thought it was in Elm Park itself. So thanks for enlighten me on that.I live about 2mi.,from it, and drive past it daily. So glad you found this informative, Peter. It is very that they have a marker there but the placement is a bit confusing. Not many options, I suppose. I was doing some research locating civil war training camps in Massachusetts when I happened upon a utube video the showed two gentlemen using metal detectors in a corn field. They stated that the site used to be a substantial union camp. There is a large white building in the back of the corn field and the field is very close to a paved country road. They did not mention the name of town and just said they were in Massachusetts. I have tried to locate this site using Google satellite maps but have been unsuccessful. You mentioned that you had accounted for about 23 training camps across the Commonwealth and there might have been as many as 27 or 28. The map listed only 10. I was wondering if you could you provide me with the names of the camps that were not shown on the map and what towns they were located in ? I have compared this corn field site with all of the sites on the map you provided and none seem to match. I have watched the video many times and judging by the sun casting shadows, the road the road seems to run north/south with an intersection near. Perhaps this camp is one that was not placed on your map and you have already located it. If you are familiar with this cornfield camp, I would like to know what town it is in and the name of the road. Mr. Barber, the other camps were quite small, typically used for the training of just one or two regiments. If they said the camp was substantial, chances are it is one of the 10 plotted here. I’m familiar with and have been to most of the sites. If you post a link to the video, I can take a look and let you know if I recognize it. I posted the utube link you requested regarding the cornfield where the union camp was supposed to located. I looked for a reply from you today but my post was not on your blog. I not sure if I made an error when posting my reply, or if it was removed for some reason. Here is the link again. I compared the topography all of the camps you listed on your map and none of them match this site. If you could tell me the locations of the 13 smaller camps not shown on your map, I will be able to compare them with satellite imagery. You may already know of this camps existence. If I discover that you are unaware of this camp, I will keep searching Massachusetts satellite maps and try to pinpoint it’s location. If I am successful, I will pass the information on to you. Thanks, Steve. This doesn’t resemble any of the 10 major camp sites covered in this article. I’ll reply with some further information by e-mail.